ITV's chief executive Carolyn McCall has said the broadcaster cannot keep up the aftercare of Love Island contestants "indefinitely". 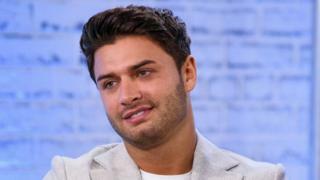 There was criticism of the hit reality show following the death of Mike Thalassitis, who took part in 2017. "We can do everything we possibly can to look after people and to do our duty of care but you can't do that forever," McCall said. "There has got to be a framework and it will come to an end." However, McCall said the broadcaster was changing its procedures to make sure counsellors do stay in contact with former contestants for longer. "We will do much more in a much more structured way," she said. McCall also said making a link between what happened to Thalassitis and Love Island would be "an extremely tenuous thing to do given how happy he was" on the ITV2 show. The ITV boss also acknowledged the "devastating" death of Sophie Gradon and revealed how "tragic" it was for the Love Island team because "they know them as people and they become friends". Love Island winner Dani Dyer has also given her views on the debate, saying many of her fellow contestants had experienced moments when they had been "struggling". "It is tough going from literally being no-one then all of a sudden overnight coming out and being someone," she told ITV's Jonathan Ross Show. She said Thalassitis's death had been "such a shock" and "absolutely devastating for everyone". She added: "It is difficult, you go from one extreme to the other and it's sad that it ended that way." Asked whether she felt she had been given access to help after her triumphant stint on the show, she said: "Yes I have had that, I have 100% had that fully." In an interview, which will be aired on Saturday, she also detailed the tests she had to go through before and after going into the villa, and said Love Island's psychologist told her to contact them whenever she needed to. In an interview with GQ magazine, Josh Denzel, who was on Love Island with Dyer in 2018, said: "I do feel like you kind of get thrown into the lion's den and if you survive then you're just free to enter the world again." Denzel said there should be more focus on contestants after the fame starts to "slow down". He said: "It's like, 'How do I transition to going back to just the guy or the girl that I was before?'" He and his co-stars such as Wes Nelson, Jack Fowler and Adam Collard have a Whatsapp group and all checked on each other after hearing the news about Thalassitis, he revealed. Speaking to BBC News earlier this month, Collard praised the team behind the show. "I know they obviously want to make good TV but the main priority is always looking after you," he said. The 23-year-old revealed that before appearing on the show he was made aware by producers in advance how he was going to be portrayed and had a "thorough" psychiatric assessment. "When I left the villa, the chaperone I lived with the week before I went in came to see me and we became good friends. "Even when I broke up with my girlfriend, who I met on the show, I think I got a text or phone call from every single one of [the Love Island] team, including the runners and producers," he said. Following Thalassitis's death, ITV said the show's medical support would be independently reviewed, and that the production team would "proactively" check up on contestants after they had left the show. The statement also said ITV would deliver "bespoke" training to all future contestants to include social media and financial management. "Conversations about mental health have never been more important," the statement concluded.